This primary market research report reveals what the respondents (all key decision-makers within sponsor organizations, CROs, and sites) consider to be the key drivers to successful patient recruitment and the approaches they utilize for global studies. Its readers will learn which entity (sponsor, CRO, or site) has the greatest potential impact on patient recruitment success, the key drivers for successfully recruiting patients (including which study characteristics impact participation), and the respondents’ insight into how they recruit for global trials. 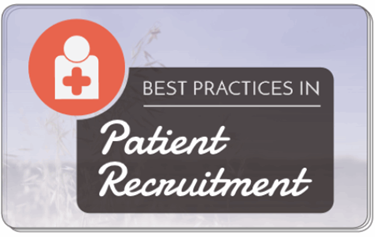 Readers of this report will learn when and how to engage with a specialized patient recruitment firm to get the best result, and will better understand the value of various patient recruitment tactics and sources for patient recruitment. Additionally, they can use the report to employ best practices identified by industry peers, increasing the likelihood that the trial will be completed on-time and within the established budget. Both sponsors and CROs offered insight into their experiences working with 18 different specialized patient recruiting firms, including: Academic network (a Stericycle company), Acurian (a PPD company), BKK Worldwide, CAHG Trials, Clariness, Clinical List America, Clinical Site Services, Clinical Trial Media, DAC Patient Recruitment Services, MediciGlobal, MMG, PatientsLikeMe, Patient Recruiters International, Praxis Communications, Resolutions Rapid Enrollment Solutions, Synexus, The Patient Recruiting Agency, and Threewire. CROs evaluated in the report include: Accell, Accellovance, Accenture, Bioclinica, Bioskin, Celerion, Chiltern (including Theorem), Clinical Research Services (CRS), Clinipace, Clinlogix, Clinsys, Cognizant, Covance, DaVita Clinical Research, DCRI-Duke, Encorium, Eurofins, Eurotrials, Frontage, Hungaro Trial, ICON, Inamed, INC Research, inventive Health Clinical, KCR, Lambda, Medpace, Medsource, NAMSA, Novotech, PAREXEL, Pharm-Olam International, PPD, PRA, Premier Research, ProTrials, QPS, Quintiles, Rho, SanaClis, SGS Life Sciences, Southern Star, SPRI Clinical Trials, Symbio, SynteractHCR, Tata, TKL Research, West Coast Clinical Trials, and Worldwide Clinical Trials. Download the preview file for more information.